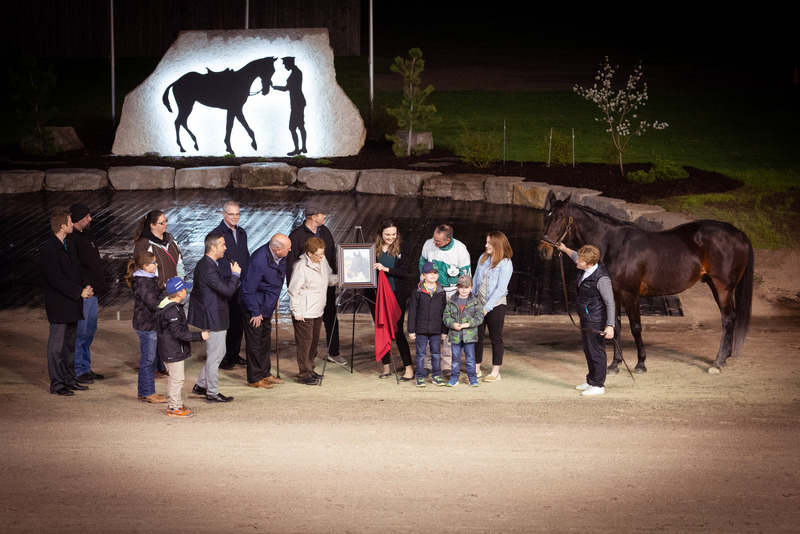 Bridge Street, a longtime fan favourite at The Raceway at Western Fair District, was inducted into the track’s prestigious Wall of Fame during an emotional ceremony on Friday night. The now 21-year-old led the post parade for the Wall of Fame race on Friday with co-owner and longtime trainer Scott McNiven in the bike. Scott’s wife Kim, the regular caretaker for Bridge Street, was in tears as she led the gelding back into the winner’s circle for the induction ceremony. Also on hand were fellow co-owners Tom Brodhurst and Shirley Griffin along with several friends and family. A large crowd lined the fence to get a look at Bridge Street who amazed them with his impressive physical appearance and charismatic personality. Bridge Street was a fierce competitor on the race track who possessed an innate will to win. In total, the son of Armbro Emerson captured 58 wins during his 361-race career that spanned 11 years. The former $10,000 yearling purchase amassed more than $676,000 along the way. Fans are reminded that there is a special matinee program scheduled for Mother’s Day, this Sunday afternoon, with first post at 1:15 p.m. The $150,000 Camluck Classic is now just two weeks away. The field of eight will be finalized this week. The Raceway has a huge night planned and full details are available at www.camluckclassic.ca.